You Need a CRM Implementation Strategy, yes you do. I am sure you have heard the saying, “just throw a bunch of stuff against the wall and see what sticks.” Yeah, that does not work when it comes to CRM. Implementing a successful CRM strategy into your organization takes careful planning, effective training, and commitment to the cause. CRM implementation does not happen overnight, and it certainly does not happen if no one uses it. Why have a CRM Implementation Strategy? You see? Careful planning makes all the difference. Here are our biggest pieces of advice when starting out with CRM. Too often, we see clients subscribe to a CRM platform, and then never put aside the time to actually set it up and use it. If you are going to invest in CRM then why not take the time to set it up properly and make it work FOR you? We understand that implementing a CRM takes time, but once you put the time in, the rewards are far greater than if you just push it to the wayside. If you want your sales people to use CRM day-in and day-out then you should be the first one using it. Just like in my post, “Become an Agent of Change in your Organization,” getting everybody to ‘rally around the flag’ is a good indicator for future success. Each and every member of your team should be able to utilize the CRM platform. Because a Complete CRM houses so much data everyone from the top-down can utilize it in some way or another. If the solution you choose offers training, or if you have a consultant, take the time to do the training. I cannot express this enough. Get the team together each week, maybe even a few times a week, to learn the ins-and-outs of the platform. The more they understand the system, the more likely they are to use it. Plus, practice makes perfect, right? We suggest working together with our consultants and support staff to create an implementation timeline. This means, establishing specific training dates and goals to reach at each training session. 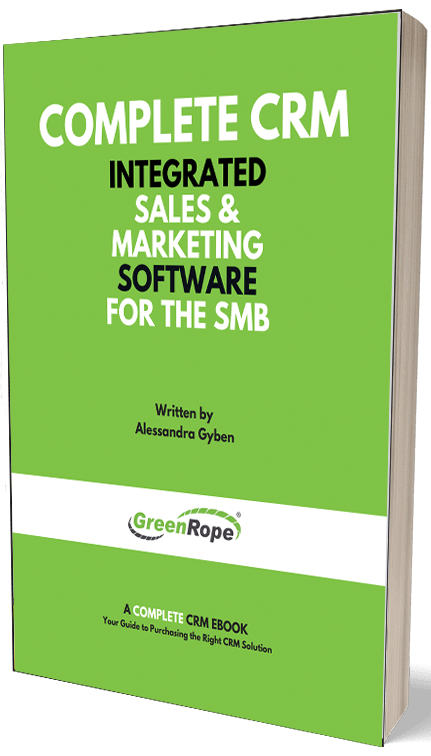 This gives your implementation a direction and ensures you touch on all aspects of the CRM, and are better equipped to start using the software to its fullest. Think your CRM is going to populate itself with all of your data? Think again. Just like anything, if you want something, you’ve got to make it happen. CRM is no different. If something does not make sense to you, or if you are having a problem, then connect with the support staff, schedule a training, or actively seek out answers within the Knowledge Base. Because CRM is so new to many, it is not always clear on what is the most effective way to set things up. Ask the professionals. GreenRope has almost 24/7 support via email, chat, and phone. Make use of the Support staff. They are experts in the system, and can solve your issues quickly and efficiently. This brings me to my next point, be responsive. Whether you are just trying to solve an issue with support, or working with an implementation team or consultant, it is important that you and your team not only be proactive, but responsive as well. The only way we can truly help you to the best of our ability is to understand the needs of your business. The only way we can understand these needs, and gauge the scope of work is if you are communicative. The more responsive you are, the quicker we can get you up and running. Even if you are working with a team to help customize your CRM, your drip campaigns, templates, signup forms, etc, remember that you are still the head honcho when it comes to your business. We rely on your expertise of the industry to set your CRM and marketing automation up. The more communicative we all are, the more successful your implementation will be. We know that implementing a CRM does not happen at the drop of a hat, but that is why we are here to support you every step of the way. Take full advantage of GreenRope’s training packages and QuickStarts, to get up and running quickly and seamlessly. For more information on why proper CRM implementation is so important, click here.